This one I made for granddaughter number 2. 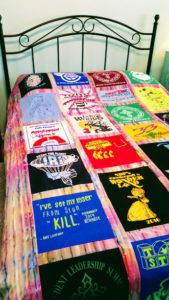 She had so many shirts, but I used 25 in this quilt. And the borders and sash are batiks from my stash. It’s at the quilter’s now. Great stuff that you have been doing. Happy to see you have returned to the blog world. Super fun to own a traveling quilt too!